Pumpkin pie, cranberry dressing, sweet potato casserole, and of course the Turkey all come to mind when planning Thanksgiving dinner and all of the day’s festivities. All of our family favorites are a delicious once-a-year treat, but they certainly come at a cost. Did you know the average cost of a Thanksgiving dinner has hovered at just under $50 for the past several years now? While the price is lower than it has been for the past few years, that’s still a lot of money! Even if you don’t spend that much, the cost of this one meal really adds up the more friends and family gather around your dinner table. If you’re hosting Thanksgiving dinner this year, don’t agonize over the cost. Here’s how to host a frugal Thanksgiving dinner for your friends and family. 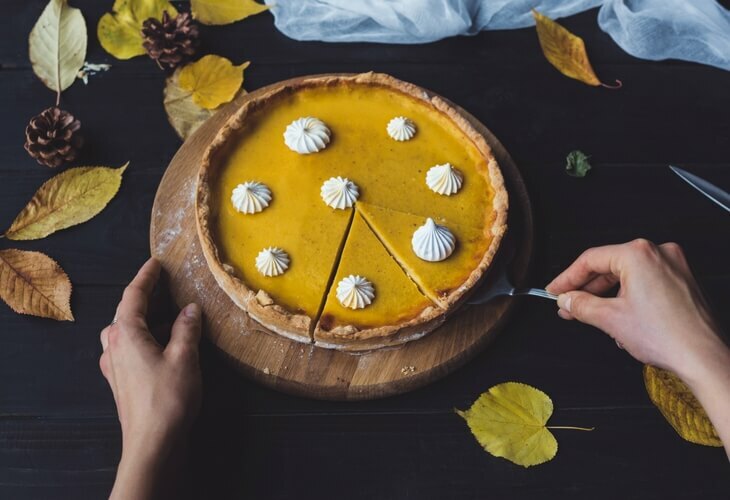 When you go grocery shopping for Thanksgiving meal ingredients, make sure you’re using apps, like Ebates to earn cash back rewards on everyday purchases. Also, make sure you have a reward card for the grocery stores you know you’ll shop at for Thanksgiving groceries. If you have a Target RED Card, you can save 5% on all of your purchases. If you don’t already have a card, go to the store now and get one. The savings you can earn will help you save a lot on an expensive Thanksgiving dinner. Don’t forget to check sites like Coupons.com to print coupons before you leave the house. When you go to buy your turkey, make sure you allot for 1.5 pounds per person, especially if you really enjoy turkey leftovers. Since the price of turkey will only steadily incline as we get closer to Thanksgiving, you may want to consider buying a frozen turkey now. You can always stash it in your freezer until the week of Thanksgiving. By buying a frozen turkey, you’ll save quite a bit on the price per pound, meaning that you’ll be slashing the overall price per meal for your guests. Vegetables and casseroles are good foods to have at your frugal Thanksgiving dinner. When buying the ingredients you need for these dishes, make sure to check the frozen food aisle for the cost per unit before you leave the store. Certain things like green beans, corn, and mixed vegetables will be much less expensive than the price of fresh produce. One of the most inexpensive ways to host a frugal Thanksgiving dinner is to simply host a potluck. The price for the overall meal may still hover at $50, but spread out over multiple families, no one will feel the financial brunt of hosting. If you’re the host, offer to provide the turkey and pumpkin pie. Then ask everyone else to bring a side dish, bottle of wine, bread, or other desserts. Potlucks are also a great way to make sure everyone at the meal has something that they enjoy and will look forward to eating. Also ask your guests to be sure to bring along extra copies of their recipe. So if their dish is a hit, people can enjoy making it themselves throughout the rest of the year as well. After your Thanksgiving dinner, try to keep the rest of the day’s activities frugal as well. Have everyone relax in the living room to watch the parade or a movie. Hopefully a couple of people will pitch in with de-boning the turkey and cleaning up after the meal. Next, dig out some board games and cards to entertain guests for hours. There will still be plenty of things to snack on so you don’t have prepare more food. Spending time relaxing, watching movies, and playing games with my family is my favorite part of Thanksgiving. That part of the day doesn’t cost a dime as we always watch movies we already have or something off of Hulu, and the games we play are old family favorites. You cooked for hours, roasted a giant, delicious turkey, hosted friends and family, and then ate yourself into a tryptophan-induced oblivion. Now your fridge is bursting at the seams with leftover Thanksgiving food, and you feel like you’ll never be able to use it all. Don’t let your frugal Thanksgiving meal go to waste! Get creative with your leftovers, and use recipes that will prevent your good food (and money) from going in the trash. You can make way more than just cold turkey sandwiches with your leftovers. Here are 10 creative ways to re-cook, re-use, or freeze your Thanksgiving leftovers into fun, easy, or convenient meals. If you have a bunch of leftover dinner rolls, turn them into French toast casserole for breakfast the next morning. Rip or cut the bread into little pieces. Whisk eggs with some milk, sugar, and cinnamon, and toss the mixture with the bread. Bake in a casserole dish at 375 degrees Fahrenheit or until cooked through and lightly browned on top. Serve with syrup or leftover whipped cream. To leftover mashed potatoes, add minced onion, garlic, some flour, and egg. Fry in some oil until cooked through and brown on both sides. Check out this recipe if you don’t feel comfortable winging it. You’re going to have to trust me with this one. It sounds disgusting, but it actually works out really well. Get creative with whatever you have leftover in the fridge. It will be delicious. I promise! You have turkey, mixed vegetables, and gravy. You have everything you need for the filling of a pot pie. I like to make my pie crust from scratch, but you can find easy store-bought pie crusts in the cold section of the grocery store. Fill your crust with your filling mixture and bake until the crust is brown. Easy as pie! Use your lunch sized food storage containers to portion out homemade frozen dinners. You’ll appreciate the effort you went to on those hectic nights when you don’t have time to cook a meal. Don’t throw away those turkey bones! You spent a ton of money on that turkey, don’t let it go to waste. Use the bones to make a hearty bone broth. Bone broth freezes easily and you can use it later to make soup, rice, or a number of casseroles. When you de-bone your turkey, make sure to set aside a few quart-sized freezer safe baggies of the meat for future dinners. Frozen, previously cooked turkey works really well in stir fry, soup, casseroles, enchiladas, tacos, etc. Add your leftover cranberry sauce to your favorite BBQ sauce, toss with shredded turkey, and serve with your favorite sandwich rolls. The cranberries add an unexpected fall-flavored sweetness to the BBQ. This works great as an easy crockpot meal for the Monday after Thanksgiving. Put a Thanksgiving twist on the Southern favorite, chicken and waffles. Toss your leftover stuffing with an egg and some oil and press the mixture into your waffle maker. Serve your stuffing “waffles” with leftover gravy and top with turkey. Use the leftover wine as a base for a marinade. Red wine especially makes a great marinade. Add salt, pepper, herbs, and spices to the leftover wine, add your favorite meat, and then let it marinade overnight for dinner. Thanksgiving is only as expensive as you choose to make it. Don’t feel compelled to serve a dish just because tradition calls for it. Serve the foods you know your family likes best, and ask everyone to pitch in by bringing their favorite dish. By actively trying to cut back on costs and save money through coupons and cash back rewards programs, you’ll be able to slash that meal price and enjoy a frugal Thanksgiving dinner with your family. Plus you don’t have to let your good food and money go to waste. Use every bit of your Thanksgiving leftovers, and you’ll have easy meals for at least a week, if not more. If you won’t have a chance to eat the leftovers in the next few days, take the time to freeze the food for later. If you want some more step-by-step recipe ideas, just type “leftover Thanksgiving food recipes” into the Pinterest search browser. The ideas for Thanksgiving meal leftover are endless. How do you keep your Thanksgiving frugal? What is your favorite way to use Thanksgiving leftovers? Some grocery stores (Food Lion is one) have a coupon system where if you purchase a given amount for so many weeks, you can get a pretty big all-store coupon for Thanksgiving week. That’s one reason we’ve been going to FL instead of our standard Lowe’s Foods for October/November. That’s a great tip, Emily! I remember Food Lion doing that last year, but I missed out. I love these ideas, especially the idea of a potluck! I would also add shopping at Costco. Even if you don’t think you need “jumbo sized” containers of food, the average size at Costco isn’t as big as most people think and you’ll have tons of leftovers! Despite my love of Costco, I’m actually eating out this year 😉 haha. Sometimes you just need a break and I’m actually curious if it will cheaper. We used to shop at Costco but now the nearest one is 1.5 hours away =[ They’re great for large families that live near them though! Our store has something like that… I’ll have to be sure to watch for the exact details this year! Around me, most grocery stores offer that if you use your loyalty card to spend a certain amount on groceries for the month before, you can get a free turkey (or similar item). If you stick to one store for your regular shopping, this is an easy way to get your main dish for free. And even if you’re not hosting a potluck, guests often want to bring something, so don’t be afraid to let them know what you need. Planning ahead to get a free turkey is a great way to save money. That’s one of the biggest costs of the meal. And I agree! When I attend a dinner, I always like to bring something, even if it’s not a potluck. Great suggestions, Kristi! Since moving, last year it was just my parents, my fiance and I. This year it’s the same deal, so I told my mom to just make lasagna instead. It’s a lot cheaper than buying a turkey and everything that goes along with it, and there’s no reason to go overboard with just 4 people. It might not be the same, but sadly, it’s not the same without my entire family there anyway. Spending more money isn’t the solution! Sadly, I’m in a similar situation this year too, Erin. My husband will be working on Thanksgiving so I’m pretty sure I will just be making a roast chicken dinner for our little family the day before. We always go potluck. Usually it is with all my cousins and aunts and uncles and we get a big church that has a basketball court and we hurry and eat, move the tables and play basketball until someone is injured (because we all think we are NBA players and not a lot older). Thanksgiving is all about family and spending time together, not spending a ton of money. I do love the leftovers for the next week! I’ve never run the numbers exactly but I don’t find Thanksgiving to be all that expensive. Like others have said, store loyalty cards get you a cheap or free turkey (I often buy an extra one or two to freeze). Stuffing is cheap, so are potatoes and corn. Desserts are an extra beyond the usual, as is the wine but the food itself really isn’t all that high–especially if you figure you’ll eat it for several meals. Some of our grocery stores have a great price for turkey around Thanksgiving. I guess it’s a loss leader for them. I always manage to buy a two or sometimes three because they make for some great frugal meals later. I love your idea of a potluck. It not only saves you money but save you your sanity trying to fix everything! $50 per person!! That seems insane. Maybe my family isn’t doing Thanksgiving right ;o) I feel like ours doesn’t come out to that much. I also have a pretty intense craving for some cranberry sauce now. We plan our Thanksgiving dinner every year!Over the years I simplified it to save both time and money. As far as the American Farm Bureau Federations estimate that a Thanksgiving dinner costs just under $50 pp. I have fed our family of 7 plus guests for under $50 total. This would be a wonderful edition to my Frugal Friday Link-up. Great tips Kayla! I like the idea about hosting a potluck, I might use that one for Christmas dinner seeing as I’m hosting it this year for our extended family.